We were up bright and early in order to get a "preferred parking place" for Minnie Mee in the parking lot. Probably most of the people here are here by RV and there are a lot of restricted parking lots. It's understandable because if rigs too long park in the parking lots, it makes it difficult and nearly impossible to get around them. But we do need parking places for us. So we looked around the night before in order to find where we wanted to park. We were able to park in a lot about 1 1/2 blocks away from our ferry dock, so that worked. We were ready early, so we decided instead of waiting in the campground and driving down later, we would drive down, get our parking spot, and wait there. Tab and Deanna must have thought the same thing because they arrived before we were even completely parked. The guys walked over and got our boarding passes and confirmed our departure dock, then came back and got Deanna and I. We visited a couple shops before we boarded our boat. Once on our boat, we had assigned tables, but not seats. We weren't there long before we heard some commotion from the front. Seems that an oriental/asian woman was out buying snacks and had "previously reserved" 6 out of 8 seats at a table up front. Now the seats were not reservable but she started screaming (and I do mean screaming) at this elderly couple who had arrived. . . and with no one at the table, sat one against the window and one next to that one. This woman kept screaming at them that she had reserved those seats and they must move. They refused. The screaming woman was the only one of her party there and she had one pamphlet on one seat and that was to indicate she had set aside SIX seats? I don't think so. If you've ever been on a boat/wildlife/glacier cruise, you know that most of the time you are up out of your seat anyway. This woman made such a scene. The gentleman who remained very calm and tried to explain that they were assigned to the table as well, but she kept ranting at him. He finally went and got a boat employee who tried to reason with the woman. Sad to say, they asked the elderly couple to move. I don't know if they comped their voyage but what they should have done was escorted the offending screamer off the boat. Most every business has signs posted that they can refuse service to anyone and they should have refused her. In fact, I wrote that on my comment sheet. She ruined the voyage for those people (but they surely would not have wanted to stay in those seats at the same table with her), but ruined the calm start to our trip. Anyway, we got underway, and suffice to say. . . it was a beautiful sunny day, albeit a bit foggy, but we saw lots of wildlife. 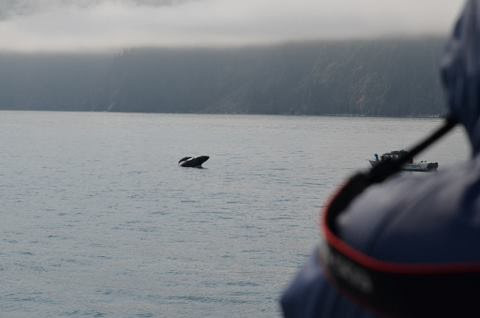 We started with humpback whales and Dall porpoise. If you've every photographed wildlife, you know if it's grazing, you may get a good shot. When it's speeding through the water moving up and down, it is a little more than difficult. So I got very few good shots. I stole some from Tab because he is a little more experienced with this. The humpbacks swim just under the surface and occasionally you will see one blow. The Dall porpoise are similar in color to the orca or killer whaler, but are much smaller, play/race at the front of the boat and just speed along making it difficult to do anything but marvel at their antics. Later we saw more humpbacks and I actually got sort of a tail shot, but it was from far away. We also saw a very large pod of killer whales. There was one very large bull with a huge dorsal fin. I did get some good pictures of these because they seemed to cooperate. We also got to see puffins. These were the tufted puffins. There is also a "horned" puffin which is my favorite, but they are interesting little birds. They don't let you get very close, but I got one shot that clearly shows the bird. In the same area, we got to see some stellar sea lions. They were hunted to near extinction and now through conservation have managed to come back and repopulate their previous territory. So it was exciting to see them. The curious little sea otter is amazing. They float on their backs in groups called "rafts" and look like they live the live of leisure. It almost looks like they are connected, but they aren't. . . they probably are in groups for safety. Ahhhh, the glaciers. We saw two large glaciers up close and several other smaller ones in between. We saw some "calving" going on, which is when section of the glacial ice break off the glacier and falls into the water. We mostly saw small parts, which actually looked like waterfalls, but it was ice falling off and literally disintegrating into powder as it fell. Large chunks of ice floated in the fjord as we poked through for a close up of the glacier. They truly are beautiful and just like pictures I have seen. The ice deep inside is blue, which I have read indicates a lack of oxygen in the ice. This happens as the ice ages, so the blue ice would be very, very old. The two largest glaciers we saw were the Holgate and the Aialik. 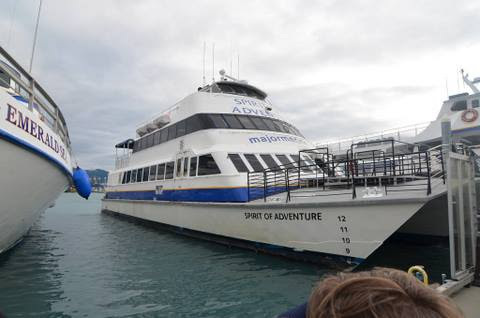 We traveled about 120 miles in our boat, which was a catamaran. We continue to use our "toursaver coupon" book. If you are planning a trip to Alaska, it is worth your money to purchase this book for $99. There are hundreds of coupons in it for "buy one get one free" offers and yesterday's tour was one of those. The tour was $169 per adult and that is all we paid for two people. Today we are going to the aquarium and it costs $20. We have a 2 for 1 coupon for that as well. We have used it at many places and have so far saved several times what we paid for the book. So check it out when/if you come this way. Also, another tip. If you think you might get seasick on a big boat. . . buy and take the seasick meds. I didn't really think I would get sick, but we all decided to take the meds. If you wait to take them when you get sick. . . it takes longer for them to work. Tab has gotten seasick before so he wanted to take it anyway. He said at one point he still got a little queasy, but didn't get sick. The rest of us did fine. So. . . take it before you get sick and you can enjoy your entire cruise. One woman at our table was sick the entire cruise. And she had taken the meds, but she still got sick. That couple was from Minnesota and two others at our table were from Israel. We had a great time talking and visiting with these people. . . unlike the screaming woman from up front. It was a great day. We had great weather and a sunny day. . . perfect for our outing. Today is misty and gray, which is more typical of the weather in Seward. We are going to the sealife center today and do a little shopping in town. Seward actually has a quaint little shopping district and we want to check it out. Tomorrow we head back up to Anchorage for the night before heading on to Valdez. Hard to believe our trip in Alaska is winding down. We still have lots to do and see, including the ferry down through the Inside Passage. That promises to be a really great trip as well. Once we start that, however, we will end our voyage in Canada and we will be heading across country back to Indiana. Homer to Seward. . .
After getting in off the ferry from Seldovia last evening, we went to the Mariner City Park on the Homer Spit. That is where Tab and Deanna went once they checked out yesterday morning. We were right on the "beach," although it is mostly rocky. There was a kite surfer that we watched for quite some time. Deanna said he had been going for at least an hour and he went almost another two hours. Wow. The winds were strong and it was very foggy, but it was pretty cool to watch him go up in the air and then down again into the water. We settled in for the night. We ran our generator a little bit when our neighbors were gone. We didn't want to disturb them. But I would like to have strangled one this morning. Quiet hours were 11 p.m. to 7 a.m., but she started her generator at 5 a.m. and ran it for about 45 minutes. Grrrr. We started the drive back up through Soldotna about 9 a.m. We stopped there and topped off some supplies at the Fred Meyer store. Terry and I left then while Tab and Deanna fueled. We wanted to stop off at the Russian River to see if we could see any bears fishing in the river. We went to the campground and walked down the trail to the river. There were some fishermen there and one woman who was watching her husband fish said a grizzly had just been down earlier, but walked on. I didn't really want to see one face to face, but I did have my bear spray with me. We took a couple pictures and talked a bit then headed back out. The mosquitos were soooooo bad right there, so we didn't hang around. There were not nearly as many people there today as we saw earlier this week, so I'm guessing this particular run of salmon is about over. There are several different kinds of salmon and they all have their own times to run the river. Amazing how that works. Along the way, we saw some moose. . . one grazing by the side of the road. We saw him a little late and he got spooked. Terry moved over into the other lane a bit because the moose started for the road. It would be a terrible thing to hit one of those animals. Luckily he veered off and turned toward the ditch. We also saw a cow and twin babies. So cute. We did see some snow up in the mountains on the way down here. . . kind of mini-glaciers. We got to Seward behind Tab and Deanna and decided to go down into the town and see where our tour leaves from tomorrow. We are taking a 7.5 hours Kenai Fjords Wildlife and Glacier cruise. Pretty exciting. We leave at 10 a.m. and return around 5:30 p.m. They are serving a prime rib/salmon buffet, so we are pretty pumped for that! Whoo hoo! Hopefully we will see lots of great wildlife. There happened to be a cruise ship in the harbor. Pretty cool! We are camped at the Stoney Creek RV Campground. It is pretty nice. . . one of the nicer parks we've been in here in Alaska. We will be here for three nights. This post is out of order! This is the post for Thursday, June 27, but since I didn't get it posted, I am not able to move it up in the order. So just remember this is for yesterday! We woke up to really foggy skies on the day we were to take the fast ferry to Seldovia, which is a small community across Kachemak Bay from Homer. It is only accessible by ferry or plane. Earlier this month, we purchased an Alaska Toursaver coupon book and there are many 2 for 1 specials in it, including one for this ferry ride. So we all planned to go. We were going to go Wednesday, which was a beautiful, bright sunny day, but the ferry doesn't run on Tuesday and Wednesday. So we went today. Tab and Deanna decided to stay in camp and relax, so we were on our own. The ferry ride was exceptionally smooth. On the way out of the harbor we saw either a seal or sea otter. We really don't know which one it was. There are a lot of sea otters here and we did see some in the harbor at Seldovia. We also saw seals on the buoy heading into the harbor. The ride over was very foggy. The vessel was very comfortable with large padded seats and tables. Although people were moving about the boat, I was a bit unsteady on my feet while underway, so only stood at my seat to take pictures. Once we arrived, we walked about town. It is an interested place and there is a museum depicting the history of the town. Until the 1964 earthquake that devastated much of southern Alaska, it was the fishing hub of the area. The earthquake devastated the town and destroyed the canneries there. The boardwalk, famous for its houses and shops, lay in ruins in the ocean. Much of the town was there as well. They rebuilt portions of the town by bulldozing a large hill and fixing a rock embankment, then built shops and houses on top. The population is about 250 now and residents there are very happy and enjoy visitors. There is water, electric, and paved roads, a police departments, and restaurants. We found the village very quaint and hospitable. There was another Russian Orthodox church here, once again reflecting the heritage of the people from years ago. There were a lot of eagles here as well. They perched on top of buildings and fished the waters surrounding the town. The fog lifted some while we were in the town, but when we were ready to leave, we were once again shrouded in fog. Most of the journey back was the same. We had another enjoyable and relaxing trip back and when we arrived, we relocated to one of the city park campgrounds with Tab and Deanna.